Most people are aware that Sir Isaac Newton believed in God. But it may come as a surprise to many readers to learn that he was also an Intelligent Design advocate. What prompted me to write this post was a recent comment by Genomicus that while Newton’s remarks on the Bible were interesting, they were “irrelevant to the hypothesis that life was engineered by some intelligence(s).” Genomicus will be interested to know that Newton explicitly argued that all of the various kinds of living things in Nature were personally designed by God. Concerned about the ungodly and materialist corollaries of the excessive mechanism of Descartes and others, Newton was attempting to create a natural philosophy in which God and Spirit played a central role. Unlike Descartes, whose philosophy begins with God as an axiom, Newton’s natural philosophy was meant to lead to God through the inductive method. Natural theology provided a link between Newton’s conceptions of true natural philosophy and true religion. For Newton nature was not the result of blind chance, but the product of a God who is everywhere and whose sight is limited neither in a physical or cognitive sense. In both natural philosophy and religion, there are two ways: the way of right method and the way of corrupt method. Corrupt method in natural philosophy obfuscates as certainly as corrupt religion blinds its adherents. Just as fictitious hypotheses distracted natural philosophers from true causes, false gods led the heathen away from their true Creator. Interestingly, Snobelen also points out in his essay that Newton privately rejected the doctrine of the Trinity; for him, the one true God Whom science leads us to is God the Father. Snobelen suggests that Newton’s religious heterodoxy at a time when heresy was viewed as an offense against the State may partly account for his reticence in expressing his religious views. In this post, however, I’d like to examine Newton’s reasons for maintaining that science could lead us to God, and for espousing Intelligent Design. To explain all nature is too difficult a task for any one man or even for any one age. Tis much better to do a little with certainty & leave the rest for others that come after, then to explain all things by conjecture without making sure of any thing. And there is no other way of doing any thing with certainty then by drawing conclusions from experiments & phaenomena untill you come at general Principles & then from those Principles giving an account of Nature. Whatever is certain in Philosophy is owing to this method & nothing can be done without it. I will instance in some particulars. One principle in Philosophy is the being of a God or spirit infinite eternal omniscient, omnipotent, & the best argument for such a being is the frame of nature & chiefly the contrivance of the bodies of living creatures. All the great land animals have two eyes, in the forehead a nose between them a mouth under the nose, two ears on the sides of the head, two arms or two fore leggs or two wings on the sholders & two leggs behind & this symmetry in the several species could not proceed from chance, there being an equal chance for one eye or for three or four eyes as for two, & so of the other members. Nothing is more curious & difficult then the frame of the eyes for seeing & of the ears for hearing & yet no sort of creatures has these members to no purpose. What more difficult then to fly? & yet was it by chance that all creatures can fly which have wings? Certainly he that framed the eyes of all creatures understood the nature of light & vision, he that framed their ears understood the nature of sounds & hearing, he that framed their noses understood the nature of odours & smelling, he that framed the wings of flying creatures & the fins of fishes understood the force of air & water & what members were requisite to enable creatures to fly & swim: & therefore the first formation of every species of creatures must be ascribed to an intelligent being. These & such like considerations are the most convincing arguments for such a being & have convinced mankind in all ages that the world & all the species of things therein were originally framed by his power & wisdom. And to lay aside this argument is unphilosophical. For Newton, the existence of God was an inference we could make from observing Nature. The exquisite contrivance of living things pointed to their having been designed by “an intelligent being,” a “spirit infinite eternal omniscient, omnipotent.” That is certainly an Intelligent Design argument. The main difference between Newton’s thinking and that of the modern Intelligent Design movement is that ID advocates today would regard Newton’s conclusion that the Designer of living things must be God as going beyond what science can tell us. But even if science cannot take us all the way to God, it can certainly take us to an Intelligent Designer of Nature. Finally, Newton condemns those who reject his Intelligent Design argument as “unphilosophical” – harsh language indeed. We must remember that for Newton, the terms “science” and “natural philosophy”: in his day, the term “scientist” had not yet been coined, and scientists were still referred to as natural philosophers. What Newton was really saying was that to reject God was bad science. 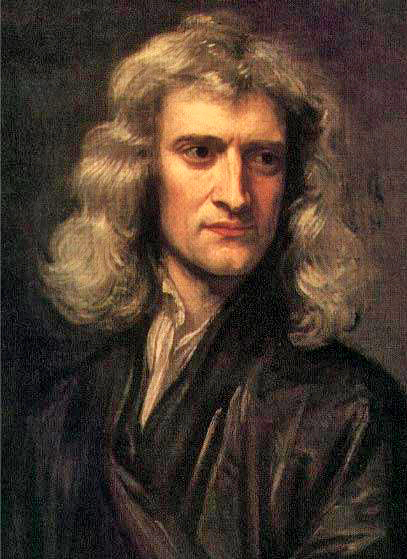 Confirmation of the claim that Newton viewed the existence of God as a scientific conclusion can be found by comparing his first principle (“the being of a God or spirit infinite eternal omniscient, omnipotent”) with his other three principles of science, which he lists in the same passage: “that matter is impenetrable by other matter”; “that all the great bodies in the Universe have a tendency towards one another proportional to the quantity of matter contained in them”; and “that all bodies are aggregated of particles laid together with many interstices or pores between them.” Nobody would deny that these principles are scientific; it is reasonable to conclude, then, that Newton viewed the existence of God as a legitimate scientific inference. Atheism is so senseless & odious to mankind that it never had many professors. Can it be by accident that all birds beasts & men have their right side & left side alike shaped (except in their bowells) & just two eyes & no more on either side the face & just two ears on either side [of] the head & a nose with two holes & no more between the eyes & one mouth under the nose & either two fore leggs or two wings or two arms on the sholders & two leggs on the hipps one on either side & no more? Whence arises this uniformity in all their outward shapes but from the counsel & contrivance of an Author? Whence is it that the eyes of all sorts of living creatures are transparent to the very bottom & the only transparent members in the body, having on the outside an hard transparent skin, & within transparent juyces with a crystalline Lens in the middle & a pupil before the Lens all of them so truly shaped & fitted for vision, that no Artist can mend them? Did blind chance know that there was light & what was its refraction & fit the eys of all creatures after the most curious manner to make use of it? These & such like considerations always have & ever will prevail with man kind to believe that there is a being who made all things & has all things in his power & who is therfore to be feared. Both Newton’s appeal to the example of the eye and his grounds for rejecting chance as an ultimate explanation of reality are highly typical of arguments that have appeared in the Intelligent Design literature of his day. The next piece of evidence I’d like to consider is the 1717/1718 edition of Newton’s Opticks. Although the original 1704 edition contained no mention of God, the Latin edition published just two years later in 1706 was quite explicit about Newton’s belief in the centrality of God to science. The relevant references can be found in the Liber Tertius (Third Book), in queries 20 and 23. Newton added some extra queries to his 1717/1718 edition, which is why Newton’s references to the role of God in science in queries 20 and 23 of the 1706 Latin edition can be found in queries 28 and 31 of the 1717/1718 edition. In his discussion of God, Newton basically repeats what he said in the 1706 edition of his Opticks. Later Philosophers banish the Consideration of such a Cause out of Natural Philosophy, feigning Hypotheses for explaining all things mechanically, and referring other causes to Metaphysicks: Whereas the main Business of Natural Philosophy is to argue from Phaenomena without feigning Hypotheses, and to deduce Causes from Effects, till we come to the very first Cause, which certainly is not mechanical; and not only to unfold the Mechanism of the World, but chiefly to resolve these and such like Questions. What is there in places almost empty of Matter between them? Whence is it that Nature doth nothing in vain; and whence arises all that Order and Beauty which we see in the World? To what end are Comets, and whence is it that Planets move all one and the same way in Orbs concentrick, while Comets move all manner of ways in Orbs very excentrick, and what hinders the fix’d Stars from falling upon one another? How came the Bodies of Animals to be contrived with so much Art, and for what ends were their several Parts? Was the Eye contrived without Skill in Opticks, and the Ear without Knowledge of Sounds? How do the Motions of the Body follow from the Will, and whence is the Instinct in Animals? Is not the Sensory of Animals that place to which the sensitive Substance is present, and into which the sensible Species of Things are carried through the Nerves and Brain, that there they may be perceived by their immediate presence to that Substance? And these things being rightly dispatch’d, does it not appear from Phaenomena that there is a being incorporeal, living, intelligent, omnipresent, who in infinite Space, as it were in his Sensory, sees the things themselves intimately, and as it were thoroughly perceives them, and comprehends them wholly by their immediate presence to himself: Of which things the Images only carried through the Organs of Sense into our little Sensoriums, are there seen and beheld by that which in us perceives and thinks. And tho’ every true Step made in this Philosophy brings us not immediately to the Knowledge of the first Cause, yet it brings us nearer to it, and on that account is to be highly valued. Now by the help of these Principles, all material Things seem to have been composed of the hard and solid Particles above mention’d, variously associated in the first Creation by the Counsel of an intelligent Agent. For it became him who created them to set them in order. And if he did so, it’s unphilosophical to seek for any other Origin of the World, or to pretend that it might arise out of a Chaos by the mere Laws of Nature; though being once form’d, it may continue by those Laws for many Ages. For while Comets move in very excentrick Orbs in all manner of Positions, blind Fate could never make all the Planets move one and the same way in Orbs concentrick, some inconsiderable Irregularities excepted which may have risen from the mutual Actions of Comets and Planets upon one another, and which will be apt to increase, till this System wants a Reformation. Such a wonderful Uniformity in the Planetary System must be allowed the Effect of Choice. And so must the Uniformity in the Bodies of Animals, they having generally a right and a left side shaped alike, and on either side of their Bodies two Legs behind, and either two Arms, or two Legs, or two Wings before upon their Shoulders, and between their Shoulders a Neck running down into a Back-bone, and a Head upon it; and in the Head two Ears, two Eyes, a Nose, a Mouth and a Tongue, alike situated. Also the the first Contrivance of those very artificial Parts of Animals, the Eyes, Ears, Brain, Muscles, Heart, Lungs, Midriff, Glands, Larynx, Hands, Wings, Swimming Bladders, natural Spectacles, and other Organs of Sense and Motion, and the Instinct of Brutes and Insects, can be the effect of nothing else than the Wisdom and Skill of a powerful ever-living Agent, who being in all Places, is more able by his Will to move the Bodies within his boundless uniform Sensorium, and thereby to form and reform the Parts of the Universe, than we are by our Will to move the Parts of our own Bodies. The term “artificial” in the passage above means: “made with skill,” or art. Newton is explicitly putting forward an Intelligent Design argument: the elaborately contrived parts of animals points to their having been made by an intelligent living Agent, who can somehow sense what’s going on anywhere and move any body (including the parts of animals) by a simple act of His Will. And yet we are not to consider the World as the Body of God, or the several Parts thereof, as the Parts of God. He is an uniform Being, void of Organs, Members or Parts, and they are his Creatures subordinate to him, and subservient to his Will; and he is no more the Soul of them, than the Soul of a Man is the Soul of the Species of Things carried through the Organs of Sense into the place of its Sensation, where it perceives them by means of its immediate Presence, without the Intervention of any third thing. The Organs of Sense are not for enabling the Soul to perceive the Species of Things in its Sensorium, but only for conveying them thither; and God has no need of such Organs, he being every where present to the Things themselves. And since Space is divisible in infinitum, and Matter is not necessarily in all places, it may be also allow’d that God is able to create Particles of Matter of several Sizes and Figures, and in several Proportions to Space, and perhaps of different Densities and Forces, and thereby to vary the Laws of Nature, and make Worlds of several sorts in several Parts of the Universe. At least, I see nothing of Contradiction in all this. And if natural Philosophy in all its Parts, by pursuing this Method, shall at length be perfected, the Bounds of moral Philosophy will be also enlarged. For so far as we can know by natural Philosophy what is the first Cause, what Power he has over us, and what Benefits we receive from him, so far our Duty towards him, as well as that towards one another, will appear to us by the Light of Nature. And no doubt, if the Worship of false Gods had not blinded the Heathen, their moral Philosophy would have gone farther than to the four Cardinal Virtues; and instead of teaching the Transmigration of Souls, and to worship the Sun and Moon, and dead Heroes, they would have taught us to worship our true Author and Benefactor. Here, Newton makes the astonishing assertion that in his view, the heathen civilizations of the past could have discovered a sound moral philosophy simply by pursuing science, but for the fact that the worship of false gods corrupted their science and prevented them from doing it properly. This most beautiful System of the Sun, Planets, and Comets, could only proceed from the counsel and dominion of an intelligent and powerful being. And if the fixed Stars are the centers of other like systems, these, being form’d by the like wise counsel, must be all subject to the dominion of One; especially since the light of the fixed Stars is of the same nature with the light of the Sun, and from every system light passes into all the other systems. And lest the systems of the fixed Stars should, by their gravity, fall on each other mutually, he hath placed those Systems at immense distances from one another. This Being governs all things, not as the soul of the world, but as Lord over all: And on account of his dominion he is wont to be called Lord God Pantokrator, or Universal Ruler. For God is a relative word, and has a respect to servants; and Deity is the dominion of God, not over his own body, as those imagine who fancy God to be the soul of the world, but over servants. The supreme God is a Being eternal, infinite, absolutely perfect; but a being, however perfect, without dominion, cannot be said to be Lord God; for we say, my God, your God, the God of Israel, the God of Gods, and Lord of Lords; but we do not say, my Eternal, your Eternal, the Eternal of Israel, the Eternal of Gods; we do not say, my Infinite, or my Perfect: These are titles which have no respect to servants. The word God usually a signifies Lord; but every lord is not a God. It is the dominion of a spiritual being which constitutes a God; a true, supreme, or imaginary dominion makes a true, supreme, or imaginary God. And from his true dominion it follows that the true God is a Living, Intelligent, and Powerful Being; and, from his other perfections, that he is Supreme or most Perfect. He is Eternal and Infinite, Omnipotent and Omniscient; that is, his duration reaches from Eternity to Eternity; his presence from Infinity to Infinity; he governs all things, and knows all things that are or can be done. He is not Eternity and Infinity, but Eternal and Infinite; he is not Duration and Space, but he endures and is present. He endures forever, and is every where present; and, by existing always and every where, he constitutes Duration and Space. Since every particle of Space is always, and every indivisible moment of Duration is every where, certainly the Maker and Lord of all things cannot be never and no where. Every soul that has perception is, though in different times and in different organs of sense and motion, still the same indivisible person. There are given successive parts in duration, co-existent parts in space, but neither the one nor the other in the person of a man, or his thinking principle; and much less can they be found in the thinking substance of God. Every man, so far as he is a thing that has perception, is one and the same man during his whole life, in all and each of his organs of sense. God is the same God, always and everywhere. He is omnipresent, not virtually only, but also substantially; for virtue cannot subsist without substance. In him are all things contained and moved; yet neither affects the other: God suffers nothing from the motion of bodies; bodies find no resistance from the omnipresence of God. ‘Tis allowed by all that the supreme God exists necessarily; and by the same necessity he exists always and every where. Whence also he is all similar, all eye, all ear, all brain, all arm, all power to perceive, to understand, and to act; but in a manner not at all human, in a manner not at all corporeal, in a manner utterly unknown to us. As a blind man has no idea of colours, so have we no idea of the manner by which the all-wise God perceives and understands all things. He is utterly void of all body and bodily figure, and can therefore neither be seen, nor heard, not touched; nor ought he to be worshipped under the representation of any corporeal thing. We have ideas of his attributes, but what the real substance of anything is we know not. In bodies, we see only their figures and colours, we hear only the sounds, we touch only their outward surfaces, we smell only the smells, and taste the savours; but their inward substances are not to be known, either by our senses, or by any reflex act of our minds; much less then have we any idea of the substance of God. We know him only by his most wise and excellent contrivances of things, and final causes; we admire him for his perfections; but we reverence and adore him on account of his dominion. For we adore him as his servants; and a God without dominion, providence, and final causes, is nothing else but Fate and Nature. Blind metaphysical necessity, which is certainly the same always and every where, could produce no variety of things. All that diversity of natural things which we find, suited to different times and places, could arise from nothing but the ideas and will of a Being necessarily existing. But, by way of allegory, God is said to see, to speak, to laugh, to love, to hate, to desire, to give, to receive, to rejoice, to be angry, to fight, to frame, to work, to build. For all our notions of God are taken from the ways of mankind, by a certain similitude which, though not perfect, has some likeness, however. And thus much concerning God; to discourse of whom from the appearances of things, does certainly belong to Natural Philosophy. What follows from all this? First, Newton was no friend of methodological naturalism. Second, were he alive today, he would warmly applaud the efforts of the Intelligent Design movement to discover patterns within Nature which were arranged by an intelligent cause for a purpose. For his part, Newton was quite certain that the Designer was God. Modern-day Intelligent Design proponents are wary of drawing that inference on scientific grounds alone, given the evidence that is currently available. However, one could certainly argue that the fine-tuning of not only our universe, but of the multiverse itself, points to the existence of a Supernatural Agent Who is not bound by physical laws. Identifying this Agent with the God of classical theism is another matter, however. Scientific reasoning might show that this Supernatural Agent is devoid of physical parts; but it is another thing entirely to show that this Agent is utterly simple and in no way composite. To reach that conclusion, we need metaphysics. What is taught in metaphysics, if it is derived from divine revelation, is religion; if it is derived from phenomena through the five external senses, it pertains to physics; if it is derived from knowledge of the internal actions of our mind through the sense of reflection, it is only philosophy about the human mind and its ideas as internal phenomena likewise pertain to physics. To dispute about the objects of ideas except insofar as they are phenomena is dreaming. In all philosophy we must begin from phenomena and admit no principles of things, no causes, no explanations, except those which are established through phenomena. Quite right. However, a Cause that is established through the study of natural phenomena need not be itself natural. That was the whole point of Newton’s arguments for an Intelligent Designer of Nature in the 1717 edition of Opticks. In other words, Newton believed that natural phenomena – and especially the contrivances we find in the parts of living organisms – could be used to scientifically infer the existence of a supernatural Being, as the statements cited above from the 1717 edition of Newton’s Opticks clearly demonstrate. So I would like to ask: if Isaac Newton, the greatest scientist who ever lived, didn’t know of any “rule” prohibiting scientists from reasoning about the supernatural, then why should we consider ourselves bound by such a rule? Given Materialism, What Reason Do We Have to Trust Ourselves? I find it incomprehensible that anyone could imagine that random, functionless activity, on the part of who knows what, could lead to the creation of entities not only of the general level of sophistication of human beings but, specifically, the latter, themselves, being able to design and engineer all manner of highly complex objects – although nothing near the level of sophistication of the random, functionless activity, of course…. What matchless insult to reason. I mean, of course, ‘…. – although nothing near the level of sophistication, with which the random, functionless activity is able to invest its creatures and creations. The folly is too extreme for use in a Monty Python script. It just wouldn’t be funny; like nothing turning itself into everything. So, really, this appellation of the term, Creationist, is utterly misconceived, as a putative jibe of the materialists, since far from disclaiming Creation, they are simply imputing it to the mindlessly random, functionless activity, they take for the Creator. Newton is certainly right about the need for a super-intelligent designer. However, I see no necessity, based on his arguments, for an omnipotent/omniscient designer. I am of the opinion that the concepts of omnipotence and omniscience are illogical for several reasons, not the least of which is that they lead to an infinite regress. I see no necessity, based on his arguments, for an omnipotent/omniscient designer. I am of the opinion that the concepts of omnipotence and omniscience are illogical for several reasons, not the least of which is that they lead to an infinite regress. The supreme God is a Being eternal, infinite, absolutely perfect; but a being, however perfect, without dominion, cannot be said to be Lord God; for we say, my God, your God, the God of Israel, the God of Gods, and Lord of Lords; but we do not say, my Eternal, your Eternal, the Eternal of Israel, the Eternal of Gods; we do not say, my Infinite, or my Perfect: These are titles which have no respect to servants. The word God usually a signifies Lord; but every lord is not a God. It is the dominion of a spiritual being which constitutes a God; a true, supreme, or imaginary dominion makes a true, supreme, or imaginary God. And from his true dominion it follows that the true God is a Living, Intelligent, and Powerful Being; and, from his other perfections, that he is Supreme or most Perfect. He is Eternal and Infinite, Omnipotent and Omniscient; that is, his duration reaches from Eternity to Eternity; his presence from Infinity to Infinity; he governs all things, and knows all things that are or can be done. He is not Eternity and Infinity, but Eternal and Infinite; he is not Duration and Space, but he endures and is present. He endures forever, and is every where present; and, by existing always and every where, he constitutes Duration and Space. Since every particle of Space is always, and every indivisible moment of Duration is every where, certainly the Maker and Lord of all things cannot be never and no where. Now it might be a surprise to learn that steps 2–7 of this argument are relatively uncontroversial. Most philosophers would agree that if God’s existence is even possible, then he must exist. So the whole question is: Is God’s existence possible? The atheist has to maintain that it’s impossible that God exists. He has to say that the concept of God is incoherent, like the concept of a married bachelor or a round square. But the problem is that the concept of God just doesn’t appear to be incoherent in that way. The idea of a being which is all-powerful, all knowing, and all-good in every possible world seems perfectly coherent. And so long as God’s existence is even possible, it follows that God must exist. Where this argument has gained purchase is in the materialist/atheist appeal to the multiverse (an infinity of possible worlds) to try to ‘explain away’ the extreme fine tuning we find for this universe. The materialist/atheist, without realizing it, ends up conceding the necessary premise to the ontological argument and thus guarantees the success of the argument and thus insures the 100% probability of God’s existence! The problem is, that there is a want of understanding of the difference between contingent and necessary being. There is utterly no need of infinite regress of causes — Dawkins’ blunder — in the conception of God. Asking who made God is perhaps precocious in a 3 or 4 year old, it is however inexcusable in anyone with a decent College education (especially where imagined to be a rhetorical Sunday punch). PS: Mapou may wish to cf. here on for a 101. Well has science, since Newton’s day, brought us nearer to knowledge of that first cause? Although the creation of the entire universe approximately 14 billion years ago certainly testifies to the fact that we are ‘brought nearer to that knowledge’ of God, we can be brought even nearer to that knowledge of God, through science, by looking at a photon of energy. Thus every time we see (consciously observe) a single photon of ‘material’ reality we are actually seeing just a single bit of information that was originally created from a very specific set of infinite information that was known by the consciousness that preceded material reality. i.e. information known only by the infinite Mind of omniscient God! Excerpt from Notes: The state-space of quantum mechanics is an infinite-dimensional function space. Some physical theories are also by nature high-dimensional, such as the 4-dimensional general relativity. Excerpt: Researchers at the University of Rochester have made an optics breakthrough that allows them to encode an entire image’s worth of data into a photon, slow the image down for storage, and then retrieve the image intact.,,, Quantum mechanics dictates some strange things at that scale, so that bit of light could be thought of as both a particle and a wave. As a wave, it passed through all parts of the stencil at once, carrying the “shadow” of the UR with it. Excerpt: By its conventional definition, a photon is one unit of excitation of a mode of the electromagnetic field. The modes of the electromagnetic field constitute a countably infinite set of basis functions, and in this sense the amount of information that can be impressed onto an individual photon is unlimited. I am of the opinion that the concepts of omnipotence and omniscience are illogical for several reasons, not the least of which is that they lead to an infinite regress. How do you determine that an infinite regress must follow? I am not talking about infinite regress of causes. This is not a problem in my view. As a Christian who have read the book of Isaiah, I am aware of the claim by Yahweh that he is the chief God and there was no other God before he showed up and that there will be no other God afterwards. This tells me that Yahweh (the ancient of days and the creator of the universe) had a beginning. This, to me, means that Yahweh had a physical body because only the physical can be created or have a beginning. Spirits, including Yahweh’s spirit can be neither created nor destroyed. Spirits are transcendental and exist in a changeless realm. I also know from reading Genesis that Yahweh regretted creating man. This is not a sign of infinite knowledge, in my opinion. There are many other similar examples in the scriptures. One of my favorites is that we are told Yahweh waits for news reports from his angels (I’ll look for the verses when I get more free time). Again, if you know everything, you don’t need messengers to deliver the news. Omnipotence and omniscience lead to an infinite regress by definition. They mean infinite power and infinite knowledge respectively. Any attempt at encompassing either leads to an infinite regress. This would not be a problem if infinity was a logical concept. Why is infinity illogical? because any finite number is infinitely small compared to the infinitely big, a contradiction. This is my main argument. In conclusion, I don’t see why being a Christian means that I have to believe in infinity, an illogical concept invented by man. Being a Christian does not mean that I have to park my brain in a closet. This tells me that Yahweh (the ancient of days and the creator of the universe) had a beginning. Being a Christian does not mean that I have to park my brain in a closet. Oh OK, since you are supporting your view through whay I perceive to be a misunderstanding of scripture and certainly not through logic or empirical evidence exactly why is it you think we should find your view persuasive? Excerpt: When two bodies in space orbit one another, such as a planet and a star, their paths can be easily described by Newton’s laws of gravity—they are elliptical. When another body is introduced, however, things become so complex that scientists have not been able to find a way to predict the sorts of patterns that are possible for a stable system (where they don’t run into one another eventually) to come about. Until now, just three families have been identified: The Lagrange-Euler, the Broucke-Hénon, and the figure-eight. You are ignoring my main argument. Mapou, you are claiming that at one time there was not a god of limited power and then at another time there was a god of limited power. Do I really need to understand anything else? The preceding video was made by two Australian University physics professors. Moreover, special relativity (and general relativity) also confirm that the ‘eternity’ for this higher dimension, in that time, as we understand it temporally, would come to a complete stop at the speed of light. To grasp the whole ‘time coming to a complete stop at the speed of light’ concept a little more easily, imagine moving away from the face of a clock at the speed of light. Would not the hands on the clock stay stationary as you moved away from the face of the clock at the speed of light? Moving away from the face of a clock at the speed of light happens to be the same ‘thought experiment’ that gave Einstein his breakthrough insight into e=mc2. Yet light, even though it is ‘eternal’ to our temporal framework is still not the highest value of ‘eternal time’, i.e. even though light has this ‘eternal’ attribute in regards to our temporal framework of time (the attribute of time not passing), for us to hypothetically travel at the speed of light, in this universe, will still only get us to first base as far as the eternal framework of quantum entanglement, and/or quantum teleportation, is concerned. i.e. Hypothetically traveling at the speed of light in this universe would be, because of time dilation, instantaneous travel for the person going at the speed of light. This is because time does not pass for them at the speed of light, yet, and this is a very big ‘yet’ to take note of, this ‘timeless’ travel is still not instantaneous and transcendent of our temporal framework of time as quantum teleportation and entanglement are, i.e. Speed of light travel, to our temporal frame of reference of time, is still not completely transcendent of our temporal time framework since light appears to take time to travel from our temporal perspective. Yet, in quantum teleportation of information, the ‘time not passing’, i.e. ‘eternal’, framework of time is not only achieved in the speed of light framework/dimension, but is also ‘instantaneously’ achieved in our lower temporal framework. That is to say, the instantaneous teleportation/travel of quantum information is instantaneous to both the temporal and speed of light frameworks, not just the speed of light framework. Information teleportation/travel is not limited by time, nor space, in any way, shape or form, in any frame of reference of time, as light is seemingly limited to us in this temporal framework. Thus ‘pure transcendent information’ (in quantum teleportaion experiments) is shown to be timeless (eternal) and completely transcendent of all material frameworks. Moreover, concluding from all lines of evidence we now have (many of which I have not specifically listed here); transcendent, eternal, infinite information is indeed real and the framework in which ‘It’ resides is the primary reality (highest dimension) that can exist, (in so far as our limited perception of a primary reality, a highest ‘uncaused’ dimension, can be discerned). How is this quote relevant to the question of whether biological life was engineered or not? Actually Genomicus, since you can’t even account for the functional information in a single protein, much less can you account for the functional information you are writing in your post without referring to your own mind, contrary to whatever you may prefer to believe beforehand, since the foundational conflict/question between ID and Darwinism is, “from whence are these staggering levels of unfathomed functional information coming from in life?? ?”, then I think it is very relevant to note that the greatest increases of human knowledge have been intimately associated with Christianity. i.e. There is an inexplicable Christian pattern to the ‘discovery’ of modern science. Excerpt: I had discovered that over the same period of the twentieth century that the US had risen to scientific eminence it had undergone a significant Christian revival. ,,,The point I put to (Richard) Dawkins was that the USA was simultaneously by-far the most dominant scientific nation in the world (I knew this from various scientometic studies I was doing at the time) and by-far the most religious (Christian) nation in the world. How, I asked, could this be – if Christianity was culturally inimical to science? Excerpt: Historians and sociologists have remarked on the occurrence, in science, of “multiple independent discovery”. Robert K. Merton defined such “multiples” as instances in which similar discoveries are made by scientists working independently of each other.,,, Multiple independent discovery, however, is not limited to only a few historic instances involving giants of scientific research. Merton believed that it is multiple discoveries, rather than unique ones, that represent the common pattern in science. It is very interesting to note that quantum entanglement, which conclusively demonstrates that ‘information’ in its pure ‘quantum form’ is completely transcendent of any time and space constraints, should be found in molecular biology on such a massive scale, for how can the quantum entanglement ‘effect’ in biology possibly be explained by any material (matter/energy) ’cause’ when the quantum entanglement ‘effect’ falsified material particles as its own ‘causation’ in the first place? (J. Bell, A. Aspect, Anton Zeilinger) Appealing to the probability of various configurations of material particles, as Darwinism does, simply will not help since a timeless/spaceless cause must be supplied which is beyond the capacity of the material particles themselves to supply! To give a coherent explanation for an effect that is shown to be completely independent of any time and space constraints one is forced to appeal to a cause that is itself not limited to time and space! i.e. Put more simply, you cannot explain a effect by a cause that has been falsified by the very same effect you are seeking to explain! Improbability arguments of various ‘special’ configurations of material particles, which have been a staple of the arguments against neo-Darwinism, simply do not apply since the cause is not within the material particles in the first place! Are Humans merely Turing Machines? I’m no Darwinian. I’m an ID proponent. You know this, so why do you keep associating me with Darwinian evolution? Just because I don’t conform to the orthodoxy of the ID movement doesn’t mean I’m not an ID proponent. I’m no Darwinian. I’m an ID proponent. You (BA77) really do have to push your religion into every discussion, don’t you? Although the molecular cause of death is not completely understood, we are steadily converging on an answer. Or perhaps it was your ERV argument against lifepsy the other day that threw me off Genomicus?? But now I see, correct me if I’m wrong, that you are into fairly extreme form of frontloading. Sorry for my mistake. Thanks for your comments. First, I just wanted to say that I’ve very much enjoyed the articles on your Website. They’re great, and I look forward to reading more of them. I really appreciate the efforts you’ve made to come up with detailed, falsifiable predictions for your front-loading model for Intelligent Design. That’s the stuff that real science is made of. Second, I agree with you that the quote you highlighted from Newton in #16 above (and in the comment I linked to) is not relevant to the question of whether biological life was engineered or not. That was the point of my post: to come up with quotes from Newton that were relevant. I did some digging, and discovered that Newton repeatedly invoked Intelligent Design arguments in the 17th and 18th centuries. Of course, they’re relatively unsophisticated arguments by today’s standards, but one would expect the debate to have sharpened in the intervening 300 years. The important thing is that Newton was firmly on our side, and that he thought he had the science to prove it. What’s more, he was no methodological naturalist: he was quite happy for science to inquire into the supernatural. Thanks again for your contributions to ID. It’s been great hearing from you. What is the working definition of ‘supernatural’ within the context of Newton’s views vs. modern science? There was a time when I was just as dogmatic as you are, maybe even more. I have changed a lot over the years. And I continue to change all the time. If you have sensible arguments against my stance on infinity, omnipotence and omniscience, let’s hear them. I’m always willing to recognize the errors of my ways and I’m ready to recite a thousand mea-culpas the instant they come to my attention. Please make your replies short and to the point, otherwise, it is unlikely that I will read them due to time constraints. Well Mapou, you are the one claiming that at one time the creator of this universe did not exist and is of limited power and then at another time the creator of this universe did exist. I REALLY don’t think a ‘sensible’ argument has to elucidated against such a ludicrous position since the position is itself self defeating in logic. I rest my case. See you around. And you think that scripture means what exactly? i.e. If God has not always existed how in blue blazes would He be able to know for 100% certainty that there was no god before Him? Wow. So, you insist on beating around the bush and will not admit that, in the quoted verse, Yahweh is said to have said that there was a time before him (before he was formed)? Why do you do that? Will it shatter one of your most ingrained beliefs? Do you consider your beliefs infallible? So YOU personally understand the scripture to mean that your ‘god’ was ‘formed’ at a certain point in time? Interesting take on it seeing that God created time. I don’t understand the scripture that way and have never heard of anyone claiming that that particular scripture means what you think it does. And once again, how do you explain the fact that God knows, for 100% certainty, that there was no ‘god formed’ before Him if you deny His omniscience, omnipotence, omnipresence and eternal nature? Or is that just a inconvenient fact that gets in the way of your ‘infallible’ belief that you have understood this particular scripture correctly? UD. At the cutting edge of science. The gods of the Heathens neither had a being before me nor shall continue after me: whereas the Lord is God from everlasting to everlasting; but these pretenders are but of yesterday. And withal he calls them formed gods, in a way of contempt, and to shew the ridiculousness of their pretence. Any time one posits that something has no beginning, one jumps headlong into an infinite regress. Some may believe that we mortals are not smart enough to understand infinity but, to that, I say fooey. We, too, are gods, created in the image of the Elohim. We, too, have been given intellect. I am a Christian but I certainly don’t believe that everything in the Bible is the inerrant word of God. I don’t worship the Bible because that would be idolatry. The Bible is one of many research tools available to us. And again, I don’t think God wants us to park our brains in the closet when we read the scriptures. The old adage, “search and you shall find” has to mean something. That being said, who would you rather believe, God’s own word according to Isaiah or Habakkuk’s and David’s limited opinions about God? I won’t even try to deconstruct John Wesley’s take on that verse. Anybody who has read the interlinear translation can see that Wesley is putting words in God’s mouth. It’s pathetic, really. Regarding the belief that God created time and space, let me say that I don’t believe for a second that time and space are physical entities. They are both abstract. But even if one assumes that God created time separately along with the physical universe, this would imply a beginning of time, would it not? Continuing this line of thought, one is forced to ask, if God created the universe, doesn’t this imply that he must have existed before the universe was created? To that I say that only God’s spirit existed in the spiritual realm where time and change have no meaning. This creator spirit of God is what started it all. God’s own body, by virtue of existing in the physical realm, must also have been created at some point. But the same is true of our own spirits and bodies. In conclusion, my arguments on this topic hinge almost entirely on the illogical nature of the concept of infinity. I may be wrong about infinity but I seriously doubt it. And I am glad to discover that my understanding is corroborated by Yahweh’s own words. where Y is some characteristic such as metabolic rate, stride length or life span, Yo is a normalization constant, M is body mass and b is the allometric scaling exponent. A longstanding puzzle in biology is why the exponent b is usually some simple multiple of 1/4 (4-Dimensional scaling) rather than a multiple of 1/3, as would be expected from Euclidean (3-Dimensional) scaling. And to echo Newton’s question, ‘was it by chance’ that such unique symmetry should be found in man and in no other creature’s symmetric proportions, especially given the fact that chance is the antithesis to us expecting to find any pattern of symmetry in the first place? ,,but apparently God can create creatures in His image, who can reason about squares and circles, who understand the paradox of square circles as a false dilemma. I hadn’t thought about the argument from symmetry in that way before. I think there’s a lot of hidden symmetry in Nature that we are only just beginning to uncover, and it probably constitutes a whole field of study in itself. Thanks very much for the links. BA77 appeals to Newton as a ‘prophet’ of the end times, as in, current events indicate Jesus is coming back soon! But Newton frowned upon people like BA77 and would be embarrassed by the use to which his writings have been put. Did or did not Newton ‘predict’ the restoration of Israel as a nation, long before it was feasible, and the subsequent return of Jesus following that restoration of Israel?,,, And if so why would he be ’embarrassed’ by ‘people like me’ who point that fact out?? Excerpt: For years I have been intrigued with Newton’s interpretation of Daniel 9:25 and the 62 weeks and 7 weeks (62 X 7 = 434 years, and 7 X 7 = 49 years), counted “from the going forth of the command to restore and build Jerusalem.” In his commentary on Daniel, a copy of which I have, Newton wrote that the interpretation of those 69 weeks is usually incorrect, violating the Hebrew language. He said the two numbers should not be added together as most scholars do, but the 434 years refer to Messiah’s first coming (which he demonstrated), and the 49 years refer to His second coming, after Israel is reestablished, an idea unheard of 300 years ago but happening in our generation The start date for counting has been controversial. Many thought the 49-year-count would be the date of Israel’s rebirth on May 14, 1948, but, alas, that did not work out. Other dates were tried unsuccessfully. But what if the count begins on one of the two most historical dates in Jewish history, the date in the miraculous Six-Day War when Israel captured Jerusalem and the Temple Mount: June 7, 1967? Assume the 49-year count (49 Jewish years X 360 days = 17,640 days), does start on June 7, 1967. Using a date-counter Web site at http://www.timeanddate.com/date/duration.html we learn that the 17,640-day count takes us exactly to September 23, 2015. September 23, 2015 is the Day of Atonement! What are the odds against that? Many have believed that the Second Coming will be on the Day of Atonement. If he knew this, old Isaac Newton would be doing cartwheels and back flips right now. Any time one posits that something has no beginning, one jumps headlong into an infinite regress. Let us take a simple case: the truth in the expression 2 + 3 = 5. This is self evidently true on pain of absurdity, and it is necessarily true. There is no possible world in which it will not hold, not even an empty one. This truth has no prior cause, it is incapable of ceasing to be, and it it therefore eternal. It intersects with our temporal order, but that is just because such a truth holds in any possible world. But on evidence, the observed temporal order is finite, having a definite beginning at a singularity some 13.7 BYA. That is, temporal succession so far as we can see, had a beginning. That raises the issue of a different mode of being, ETERNAL, as opposed to temporal. And in the case of God, that is the relevant mode, one that intersects with the temporal, but which is not confined to it. Indeed, one classic way of seeing eternal truths such as the above, is that they are held in the mind of God. If you want a picture, think of our globe and its North Pole. Every time zone, every longitude is simultaneously due south of the pole. Just so, every when and every where is simultaneously present to the point of eternity. I think you are mixing abstract with concrete. Things like truth and morality are abstract because they are not physical things. They are spiritual. I’ve already said that the spiritual realm is transcendental, i.e., it just is. Physical stuff, by contrast, must have a beginning. There is little doubt in my mind that God has a physical body even if his body is not made of the particles that we are familiar with. God’s body had a beginning, in my opinion, because otherwise it would lead to an infinite regress. Consider also that Yahweh calls himself the “ancient of days”. This tells me that he places his body in the physical realm where things can be young or old.